Have you noticed that the moment you establish a goal in your life, you start hearing people say, “Who do you think you are” or “It can’t be done” or “Forget about it”? The Bible tells us that Noah listened to God. And what did he hear? He heard God’s warning that the world was going to be destroyed. He believed what he had not yet seen. That’s what faith is — being certain of something we don’t see. Noah didn’t turn away from the vision God had given him. Instead, he built the ark. God is going to give you a goal for your life, and some people may think it’s pretty crazy. But you have to stay focused on what you know God has said through his Word, the Bible. Then, you have to go build your ark! Let God lead you into financial freedom! I want to help you enjoy what God has given you right now by helping you build important financial principles into your life. God gives us important advice about how to give, save, invest, and spend. 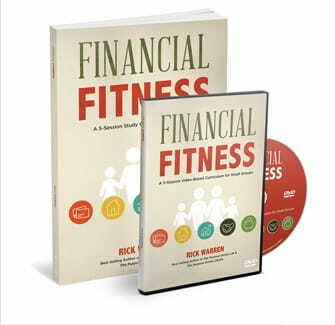 And these are the principles Pastor Rick Warren shares in his Financial Fitness study kit. We want to send you the Financial Fitness DVD Study and workbook to thank you for your gift today to help reach more people with the hope of Jesus Christ. • Understand and apply God’s advice about your money. • Do more with your money than you ever thought possible. • Feel greater peace through financial freedom. Receive your copy by giving below today—and thank you for helping share the practical and powerful principles of God’s Word with more people through Daily Hope!